A mission to place 30 copies of The Book of Mormon with willing recipients in the next 30 days. I have given six away so far, but I've been lucky to find people who have graciously accepted them or asked for a copy. I have some people in mind--mostly close friends--but I have a feeling that the Lord has his own plan for who should receive them. And he definitely knows much better than I do, who is searching for truth and who has been prepared to accept this book of scripture. If you guys could only step inside my heart for a minute, you wouldn't believe how ill-at-ease I am, which is a completely foreign feeling for me! I don't like not being in control, not having a plan, not knowing what the day holds. And this month, as I work through this challenge that I have been placed under by the Spirit, I am facing all of those things at once. "And I was lead by the Spirit, not knowing beforehand the things which I should do." As I write this, I am considering the notion that perhaps one main reason I have been asked to do this, is so that I CAN become comfortable turning control over to the Lord and walking strictly by the Holy Ghost to do his will. The one thing that I do know is that The Book of Mormon is true. I would not be staking my reputation on it, if it wasn't! It is God's word for our day. Along with the Bible, it teaches me about Jesus Christ. It teaches me who he is and the amazing things that he has done for all of us. It teaches me that one day I will stand again in his presence. I know that the writers of The Book of Mormon knew Christ. And because their records have been preserved, I know him as well. I want everyone reading this to know him too. If you are interested in receiving a complimentary copy of The Book of Mormon from me, please email me at jocelyn.christensen@gmail.com. I'll mail you a copy, along with my testimony, and The Ensign magazine that explains the origins of The Book of Mormon. You can take it from there! If you just have a question about The Book of Mormon, send it my way. 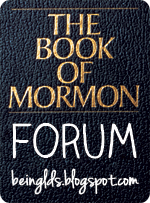 To everyone reading this who would like to share their experiences with the Book of Mormon, I will be hosting a Book of Mormon Forum Link-up on Monday. To join us, please write a post about your experience gaining a testimony of The Book of Mormon and link-up to us on Monday! way to go... out of your comfort zone led by the Spirit sounds like a good place. Before you joined the family, we were all in a small town in Colorado for church. A man came in the building wearing running clothes. He had been there training for a race when he found a Book of Mormon on the side of the road. He picked it up, planning on throwing it away, but he read it instead. When he ran past a building with the same name as in the book he decided to go to church. You just never know. I gave away two Book of Mormons as a teenager to friends when they moved away. It was really hard for me to do only because I wasn't sure how they would take it. Twenty years later and I still keep in touch with them. They haven't joined the church but I do know they still respect my beliefs. Which was a huge battle in itself in the South! Good luck on meeting your goal! Jocelyn, I love you. I want you to know that your influence is far reaching. Like, way past just placing 30 BOM's. You are enriching all of us and stretching us. I have no doubt that you can do it. And I'm going to do what I can to help you! I think it's a great idea to include the BOM Ensign with your Books of Mormon that you are giving away. That's what I've decided to do whenever I give one away, too. It's such a great issue. You put many of us to shame! Putting some in my car glove box in the morning to be ready ! Ps I have just added links to your Blog and Facebook page on the Book of Mormon 121 Facebook Page I have just created for the institute class I start teaching tomorrow. So you can inspire yet more of us !!! 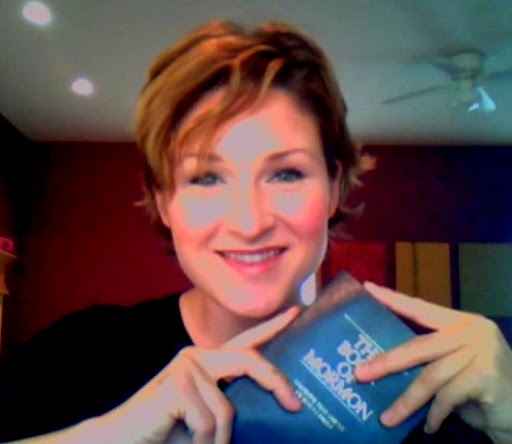 love that you are sending the Ensign with the Book of Mormon! I need to join the forum. I am so inspired. Thank you so much for helping me see that I, too, can do these kinds of things and not just be an idle bystander cheering you on. I'm telling my husband about this amazing goal. Just came across this excellent short video by Elder Holland on Mormon Messages. An excellent way to introduce the book to friends? You are a wonderful missionary! I have been thinking about that scripture in 1 Nephi too. My five year old son says it is one of his favorites. You are definitely and example to me. You are truly an inspiration!! Keep it up! Living in Utah I have to tell you I haven't had a lot of missionary experience come my way until recently. It's been amazing. I am going to share about your forum today on my blog! You're doing a great work, and you are an amazing example!